Look for it next month! Remember those scenes in Breakfast at Tiffany’s where George Peppard (Paul) earns a bit of money from his writing and he takes Audrey Hepburn (Holly) out for the day? To do a bunch of things they’ve never done before, like visit the library (her) and steal something (him). Well, I haven’t exactly cashed my cheque, but I can share that giddy, I’m-gonna-be-published (!) feeling with you today. 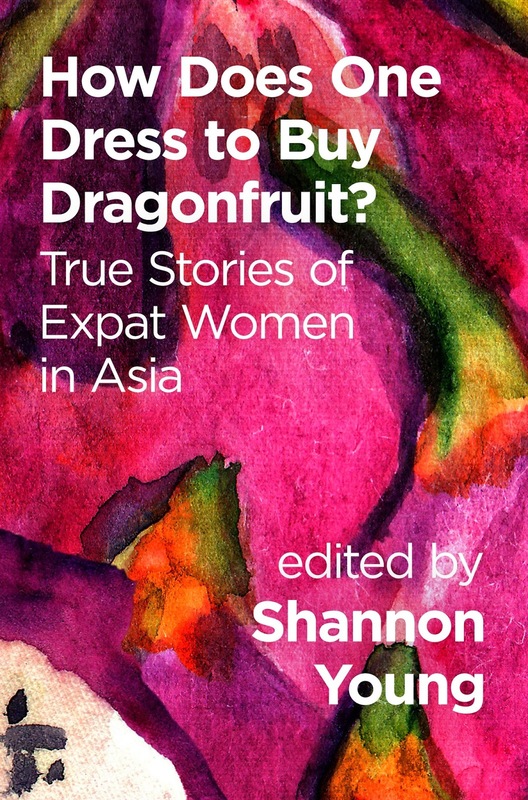 The cover art is out, the release date is set and I’m going to be part of an anthology called How Does One Dress To Buy Dragonfruit: true stories of expat women in Asia. Pretty groovy cover, don’t you think? I can’t say for sure, but I assume that the title’s question will be answered, along with many other interesting queries about life overseas, in the book. The anthology, published by Typhoon Media/Signal 8 Press, comes out in a month’s time, and my essay is titled “Bread and Knives”. It’s about Hubs and I getting robbed when I was 8 1/2 months pregnant. Danger, excitement, swollen feet! I’m looking forward to reading all of the other essays, especially the one from a former film professor of mine – Pamela Beere Briggs. She started out as my teacher and became a good friend, so it’s really cool that we’re going to be in a book together.